My research is centered on understanding the paleobiology of extinct echinoderms (starfish and their allies). My research tends to be phylogenetically oriented and echinoderms lend themselves to a phylogenetic approach because their intricate morphology, coupled with a high degree of morphological disparity, allow for the coding of robust datasets for phylogenetic analysis. 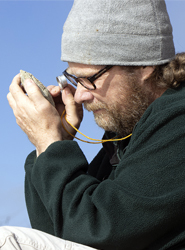 My work is focuses primarily on the Cambrian and Ordovician echinoderm radiations from a global perspective. I use specimens housed in museum collections, supplemented by an active field program to collect new material at critical intervals. What is the nature of the Cambrian-Ordovician explosive radiation of echinoderm body plans? How can phylogeny and development be used to answer paleontological questions? How is the collection of fossils and consequently our understanding of the fossil record biased by geography, time, and facies? What is the underlying homology of skeletal elements in echinoderms and how can it be used to increase the fidelity of character data used to infer phylogeny. Atwood, J.W. and Sumrall, C.D. 2012. Morphometric Investigation of the Pentremites Fauna from the Glen Dean Formation, Kentucky, Journal of Paleontology, 86(5):813-828. Bauer, J.E. C.D. Sumrall and J.A. Waters. 2015. Classifying blastoids through hydrospire morphology. p. 33-36. In S. Zamora and I. Rábano (eds.) Progress in Echinoderm Paleobiology. Cuadernos del Museo Geominero, 19. Instituto Geológico y Minero de España, Madrid. Blake, D.B., T.E. Guensburg, J. Sprinkle and C.D. Sumrall. 2007. A new, phylogenetically significant Early Ordovician asteroid (Echinodermata). Journal of Paleontology, 81:1257-1265. Broadhead, T.W. and C.D. Sumrall. 2003. Heterochrony and paedomorphic development of Sprinkleocystis ektopios, new genus and species (Rhombifera, Glyptocystida) from the Middle Ordovician (Carodoc) of Tennessee. Journal of Paleontology, 77(1):113-120. Brochu, C.A., H.N. Bryant, J.M. Theodor, M.A. O'Leary, J. Adrain, and C.D. Sumrall.2001. Modern phylogenetics in paleontology: Comments on Vermeij. Paleobiology, 27(1):174-176. Brochu, C.A, and C.D. Sumrall. 2001. Phylogenetic nomenclature and paleontology. Journal of Paleontology, 75(4):754-757. Brochu, C.A. and C.D. Sumrall. 2008. Phylogenetics and the integration of paleontology within the life sciences. p. 185-204. In P. H. Kelley R. K. Bambach (eds.) From Evolution to Geobiology: Research Questions Driving Paleontology at the Start of a New Century. Paleontological Society Papers 14, The Paleontological Society, Pittsburgh. Brochu, C.A., C.D. Sumrall, and J.M. Theodor. 2004. When clocks (and communities) collide: Estimating divergence time from molecules and the fossil record. Journal of Paleontology 78(1):1-6. Brochu, C.A., J.R. Wagner, S. Jouve, C.D. Sumrall, and L.D. Densmore. 2009. A correction corrected: consensus over the meaning of Crocodylia and why it matters, Systematic Biology, 58:537-543. Cornell, S., C.E. Brett, and C.D. Sumrall. 2003.Paleoecology and taphonomy of an edrioasteroid-dominated hardground association from tentaculitid limestones in the Early Devonian of New York: a Paleozoic rocky peritidal community. PALAIOS, 18:212-224. Dexter, T.A., C.D. Sumrall, M.L. McKinney. 2009. Allometric strategies for increasing respiratory surface area in Mississippian blastoid Pentremites. Lethaia, 42:127-137. Lefebvre B., A.N. Allaire, T.E. Guensburg, A.W. Hunter, K. Kouraïss, E. Nardin, F. Noailles, B. Pittet, S. Zamora, C.D. Sumrall. 2016. Palaeoecological aspects of the diversification of echinoderms in the Lower Ordovician of central Anti-Atlas, Morocco. Palaeogeography, Palaeoclimatology, Palaeoecology. Lefebvre B., K. Derstler, and C.D. Sumrall. 2012. A reinterpretation of the solute Plasiacystis mobilis (Echinodermata) from the Middle Ordovician of Bohemia. Zoosymposia 7:287-306. Lefebvre, B., C.D. Sumrall, R.A. Shroat-Lewis, M. Reich, G.D. Webster, A.W. Hunter, E. Nardin, S.V. Rozhnov, T. E. Guensburg, A. Touzeau, F. Noailles and J. Sprinkle. 2013.
alaeobiogeography of Ordovician Echinoderms, p. 165-190. In D.A.T. Harper and T. Servais (eds.) Early Palaeozoic Biogeography and Palaeobiogeography. Geological Society of London, Memoirs, 38. Lundin, R.F. and C.D. Sumrall. 1999. Ostracodes from the Naco Formation (Upper Carboniferous) at the Kohl Ranch locality, central Arizona. Journal of Paleontology, 73(3):454-460. McKinney, M.L. and Sumrall, C.D. 2011. Ambulacral growth allometry in edrioasteroids: Functional surface-volume change in ontogeny and phylogeny. Lethaia, 44:102-108. Mike, J., C.D. Sumrall, V. Maroulas, and F. Schwartz. 2016. Non-landmark classification in paleobiology: computational geometry as a tool for species discrimination. Paleobiology. Parsley, R.L., S.V. Rozhnov and C.D. Sumrall. 2012. A reinterpretation of the solute Maenillia (Echinodermata) from the Middle Ordovician of Russia. Journal of Paleontology. 86(3):462-469. Parsley, R.L. and C.D. Sumrall. 2007. New recumbent echinoderm genera from the Bois d’Arc Formation: Lower Devonian (Lochkovian) of Cole County, Oklahoma. Journal of Paleontology, 81:1486-1493. Rahman, I.A., J.A. Waters, C.D. Sumrall, and A. Astolfo. 2015. Early post-metamorphic, Carboniferous blastoid reveals the evolution and development of the digestive system in echinoderms, Biology letters, 11:20150776. Sheffield, S.L. and C.D. Sumrall. 2015. A new interpretation of the oral plating patterns of the Holocystites Fauna (Diploporita: Echinodermata). p. 159-162. In S. Zamora and I. Rábano (eds.) Progress in Echinoderm Paleobiology. Cuadernos del Museo Geominero, 19. Instituto Geológico y Minero de España, Madrid. Shroat-Lewis, R.A., M.L. McKinney, C.E. Brett, D.L Meyer, and C.D. Sumrall. 2011. Paleoecologic assessment of an edrioasteroid (Echinodermata) encrusted hardground from the Upper Ordovician (Maysvillian) Bellevue Formation, Maysville, Kentucky. PALAIOS, 26:470-483. Shroat-Lewis, R.A., C.D. Sumrall, M.L. McKinney, and D.L. Meyer. 2014. A paleoecological comparisom of two edrioasteroid (echinodermata)-encrusted pavements from the Upper Ordovician Corryville Formation of Florence, Kentucky and the Miamitown Shale of Sharonville, Ohio. Palios, 29:154-169. Sprinkle, J. and C.D. Sumrall. 2008. New parablastoid taxa from North America. The University of Kansas Paleontological Contributions, 16:1-14. Sprinkle, J. and C.D. Sumrall. 2015. New edrioasterine and astrocystitid (Echinodermata: Edrioasteroidea) from the Ninemile Shale (Lower Ordovician), central Nevada. Journal of Paleontology, 89: 346-352. Sumrall, C.D. 1992. Spiraclavus nacoensis, a new clavate agelacrinitid edrioasteroid from central Arizona. Journal of Paleontology, 66(1):90-98. Sumrall, C.D. 1993. Thecal designs in isorophinid edrioasteroids. Lethaia, 26(4):289-302. Sumrall, C.D. 1996. Late Paleozoic edrioasteroids (Echinodermata) from the North American midcontinent. Journal of Paleontology, 70(6):969-985. Sumrall, C.D. 1997. The role of fossils in the phylogenetic reconstruction of Echinodermata, p. 267-288. In J. A. Waters and C. G. Maples (eds.) Paleontological Society Papers Volume 3, Geobiology of Echinoderms. The Paleontological Society, Pittsburgh. Sumrall, C.D. 2000. The biological implications of an edrioasteroid attached to a pleurocystitid rhombiferan. Journal of Paleontology, 74(1):67-71. Sumrall, C.D.2001. Paleoecology of two new edrioasteroids from a Mississippian hardground in Kentucky. Journal of Paleontology, 75(1):136-146. Sumrall, C.D. 2002. A new species of Anartiocystis (Callocystitida, Glyptocystida) from the Brassfield Formation of central Kentucky. Journal of Paleontology, 76(5):918-920. Sumrall, C.D. 2008. The origin of Lovén’s Law in glyptocystitoid rhombiferans and its bearing on the plate homology and the heterochronic evolution of the hemicosmitid peristomal border. p. 228-241. In Ausich, W.I. and Webster, G.D. (eds.) Echinoderm Paleobiology. University of Indiana Press. Sumrall, C.D. 2010. The systematics of a new Maysvillian (Upper Ordovician) edrioasteroid pavement from northern Kentucky. Journal of Paleontology, 84(5):783-794. Sumrall, C.D. 2010. A model for elemental homology for the peristome and ambulacra in blastozoan echinoderms. p. 269-276. In Harris, L.G., S.A. Böttger, C.W. Walker, and M.P. Lesser. (eds.) Echinoderms: Durham, CRC Press, London. Sumrall, C.D. 2015. Understanding the oral area of derived stemmed echinoderms. p. 169-174. In S. Zamora and I. Rábano (eds.) Progress in Echinoderm Paleobiology. Cuadernos del Museo Geominero, 19. Instituto Geológico y Minero de España, Madrid. Sumrall, C.D. and A.L. Bowsher. 1996. Giganticlavus, a new genus of Pennsylvanian edrioasteroid from North America. Journal of Paleontology, 70(6):986-993. Sumrall, C.D., C.E. Brett, and S. Cornell. 2006. The systematics and ontogeny of Pyrgopostibulla belli, a new edrioasteroid (Echinodermata) from the Lower Devonian of New York. Journal of Paleontology. 80(1):187-192. Sumrall, C.D., C.E. Brett, T.A. Dexter and A. Bartholomew. 2009. An enigmatic blastozoan fauna from central Kentucky, Journal of Paleontology, 83(5):739-749. Sumrall, C.D., C.E. Brett and M.L. McKinney. 2009. A new agelacrinitid edrioasteroid attached to hardground clasts from the McKenzie Member of the Mifflintown Member (Silurian) of Pennsylvanian, Journal of Paleontology, 83(5):794-803. Sumrall, C.D. and C.A. Brochu. 2003. Resolution, sampling, higher taxa and assumptions in stratocladistic analysis – comments on Bodenbender and Fisher. Journal of Paleontology, 77(1):189-194. Sumrall, C.D. and C.A. Brochu. 2008. Viewing paleobiology through the lens of phylogeny. p. 165-183. In P. H. Kelley R. K. Bambach (eds.) From Evolution to Geobiology: Research Questions Driving Paleontology at the Start of a New Century. Paleontological Society Papers 14, The Paleontological Society, Pittsburgh. Sumrall, C.D., C.A. Brochu, and J.W. Merck Jr. 2001. Global lability, regional resolution, and majority rule consensus bias. In A.B. Smith and L.E. Park (eds. ), Beyond phylogenetic reconstruction: Tree-based approaches to paleontological questions. Special issue of Paleobiology, 27(2):254-261. Sumrall, C.D. and D.T. Carlson. 2000. Suture modification by pectinirhomb growth in Lepadocystis decorus, a new species of callocystitid glyptocystitid rhombiferan (Echinodermata) from Illinois. Journal of Paleontology, 74(3):487-491. Sumrall, C.D. and B. Deline. 2009. A new species of the dual-mouthed paracrinoid Bistomiacystis and a redescription of the edrioasteroid Edrioaster priscus from the Middle Ordovician Curdsville Member of the Lexington Limestone. Journal of Paleontology, 83:135-139. Sumrall, C.D., B. Deline, J. Colmenar, S.L. Sheffield, and S. Zamora. 2015. New data on Late Ordovician (Katian) echinoderms from Sardinia, Italy. p. 175-180. In S. Zamora and I. Rábano (eds.) Progress in Echinoderm Paleobiology. Cuadernos del Museo Geominero, 19. Instituto Geológico y Minero de España, Madrid. Sumrall, C.D. and F.J. Gahn. 2006. Morphological and systematic reinterpretation of two enigmatic edrioasteroids (Echinodermata) from Canada. Canadian Journal of Earth Science, 43:497-507. Sumrall, C.D., J. Garbisch, and J.P. Pope. 2000. The systematics of postibullinid edrioasteroids. Journal of Paleontology, 74(1):72-83. Sumrall, C.D., S. Heredia, C.M. Rodríguez and A.I. Mestre. 2012. The first report of South American edrioasteroids and the paleoecology and ontogeny of rhenopyrgid echinoderms. Acta Palaeontilogica Polonica. 9:425-454. Sumrall, C.D. and R.L. Parsley. 2003. Morphology and biomechanical implications of isolated discocystinid plates (Edrioasteroidea, Echinodermata) from the Carboniferous of North America. Palaeontology, 46(1):113-138. Sumrall, C.D. and G.A. Schumacher. 2002. Cheirocystis fultonensis, a new glyptocystitid rhombiferan from the Upper Ordovician of the Cincinnati Arch. Journal of Paleontology, 76(5):843-851. Sumrall, C.D. and J. Sprinkle. 1995. Plating and pectinirhombs of the Ordovician rhombiferan Plethoschisma. Journal of Paleontology, 69(4):772-778. Sumrall, C.D. and J. Sprinkle. 1998. Phylogenetic analysis of living Echinodermata based on primitive fossil taxa. p. 81-87. In R. Mooi and M. Tilford (eds.) Echinoderms-San Francisco. Balkema, Rotterdam. Sumrall, C.D. and J. Sprinkle. 1999. Early ontogeny of the glyptocystitid rhombiferan Lepadocystis moorei. p. 409-414. In M.D.C. Carnevali and F. Bonasoro (eds.) Echinoderm Research 1998. A.A. Balkema, Rotterdam. Sumrall, C.D. and J. Sprinkle. 1999. Ponticulocarpus, a new cornute-grade stylophoran from the Middle Cambrian Spence Shale of Utah. Journal of Paleontology, 73(5):886-891. Sumrall, C.D. and J. Sprinkle. 2015. Unusual ambulacral branching pattern in the new Ordovician giant edrioasteroid Bizarroglobus. Journal of Paleontology, 89: 353-359. Sumrall, C.D., J. Sprinkle, and R.M. Bonem. 2006. An edrioasteroid-dominated echinoderm assemblage from a Lower Pennsylvanian marine conglomerate in Oklahoma. Journal of Paleontology. 80(2):229-244. Sumrall, C.D., J. Sprinkle, and T.E. Guensburg. 1997. Systematics and paleoecology of Late Cambrian echinoderms from the western United States. Journal of Paleontology, 71(6):1091-1109. Sumrall, C.D., J. Sprinkle, and T.E. Guensburg. 2001. Comparison of flattened blastozoan Echinoderms: insights from the new Early Ordovician eocrinoid Haimacystis rozhnovi. Journal of Paleontology, 75(5):985-992. Sumrall, C.D., J. Sprinkle, T.E. Guensburg and B.F. Dattilo. 2012. Early Ordovician mitrates and a solute (Echinodermata) from western Utah, central and southern Nevada and west Texas. Journal of Paleontology, 86(4):595-604. Sumrall, C.D., J. Sprinkle, S. Pruss, and S. Finnegan. 2009. Cardiocystella, a new cornuted stylophoran from the Upper Cambrian Whipple Cave Formation, eastern Nevada, USA. Journal of Paleontology, 83:307-312. Sumrall, C.D. and J.A. Waters. 2012. Universal Elemental Homology in Glyptocystitoids, Hemicosmitoids, Coronoids and Blastoids: Steps Toward Echinoderm Phylogenetic Reconstruction in Derived Blastozoa. Journal of Paleontology, 86:956-972. Sumrall, C.D. and G.A. Wray. 2007. Ontogeny in the fossil record: diversification of body plans and the evolution of “aberrant” symmetry in Paleozoic echinoderms. Paleobiology, 33(1):149-163. Sumrall, C.D. and S. Zamora. 2011. Ordovician edrioasteroids from Morocco: Faunal exchanges across the Rheic Ocean. Journal of Systematic Palaeontology, 9:425-454. Sumrall, C.D. and S. Zamora. 2015. A columnal-bearing eocrinoid from the Cambrian Burgess Shale (British Columbia, Canada). Journal of Paleontology, 89:366-368. Waters, J.A., C.D. Sumrall, L.E. White, and B.K. Nguyen. 2015. Advancing phylogenetic inference in the Blastoidea (Echinodermata): Virtual 3D reconstructions of the internal anatomy. p. 193-199. In S. Zamora and I. Rábano (eds.) Progress in Echinoderm Paleobiology. Cuadernos del Museo Geominero, 19. Instituto Geológico y Minero de España, Madrid. Zamora, S., C.D. Sumrall, and J. Sprinkle. 2015. A new long-stemmed Eocrinoid from the Furongian Point Peak Shale Member of the Wilberns Formation (Texas). Journal of Paleontology, 89:189-193. Zamora, S., C.D. Sumrall, and D. Vizcaïno. 2013. Morphology and ontogeny of the Cambrian edrioasteroid (Echinodermata) Cambraster cannati Miquel from western Gondwana. Acta Palaeontilogica Polonica. 58:545-559. Zamora, S., B. Lefebvre, J.J. Álvaro, S. Clausen, O. Elicki, O. Fatka, P. Jell, A. Kouchinsky, J. Lin, E. Nardin, R.L. Parsley, S.V. Rozhnov, J. Sprinkle, C.D. Sumrall, D. Vizcaïno, and A.B. Smith. 2013. Cambrian Echinoderm Palaeobiogeography, p. 151-164. In D.A.T. Harper and T. Servais (eds.) Early Palaeozoic Biogeography and Palaeobiogeography. Geological Society of London, Memoirs, 38. Zhao Yu., C.D. Sumrall, R.L. Parsley, J. Peng. 2010. Kailidiscus, a new plesiomorphic edrioasteroid from the basal middle Cambrian Kaili Biota of Guizhou Province, China. Journal of Paleontology, 84 (4):668-680.